Executive Director Peggy Varfley Meres, at the head of a high power delegation from the Public Procurement and Concessions Commission (PPCC), undertook a five day study tour of Gambia Public Procurement Authority (GPPA) to understand the public procurement processes, methods used to ensure compliance with the public procurement law, information about the contractors’ database, debarment process for contractors, prequalification requirement for bidders, training and capacity building programs, among others. Members of the delegation include two directors and five officers drawn from the Information Dissemination and Communications Division, Compliance and Monitoring Division, and Office of the Executive Director. It can be recalled that PPCC, in an effort to enhance public procurement practices in Liberia, conducted a research to identify best practices within the sub region. The result of the research showed that The Gambia had established a very strong procurement authority, Gambia Public Procurement Authority (GPPA), from which PPCC could benefit through knowledge exchange. The study tour was then scheduled for March 11 to 15, 2013, with key objective areas including a comprehensive understanding of the public procurement process in The Gambia, successes and challenges. Delivering a statement on Tuesday, March 12, 2013 at the Kairaba Avenue offices of GPPA, near Banjul, Mrs. Meres called on her Gambian counterpart to forge more partnerships and alliances with Liberia and other countries in the sub region aimed at strengthening the existing capacity gap. Mrs. Meres warned that unless African governments and institutions took advantage or utilize the knowledge base of member institutions or countries, the dream of making Africa self reliance and a bastion of hope for the hopeless, will remain unachievable. The PPCC Boss made the assertions during a formal welcome ceremony held in the Conference Room of the GPPA. In a rather joyous mood, the Director General of Gambia Public Procurement Authority (GPPA), Mr. Tumbul K. Danso, thanked the visiting team for acknowledging the good works of the GPPA and for selecting Gambia for the study tour. “This is a very unique opportunity for GPPA and the country as whole especially so that our sister institution has recognized the good work of GPPA which he said has witnessed lot of improvements in its activities. It is a good thing to share our experiences as Africans and build on the mistakes so as to improve governance and ensure value for money in our respective procurement systems,” he pointed out. Presentations were delivered by staff of the GPPA in key areas of public procurement including overview of GPPA, strategies used to ensure compliance, suppliers’ database registry, establishment of procurement cadre and career development, among others. Team members of both GPPA and PPCC share their experiences with the implementation of the procurement reforms of their respective countries. 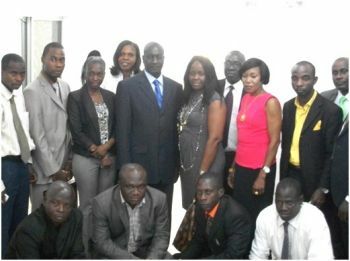 As part of activities contained in the agenda of the study tour, the PPCC team, escorted by its Gambian counterpart met with several high profile Gambian government officials and key institutions including the Minister of Finance and Economic Affairs, the Ombudsman, Gambia Competition Commission(GCC), Actionaid, among others. These high profile visits were made in an effort to ascertain how those institutions have been able to execute their mandates and to also learn from their experiences. Authorities of GPPA held a cocktail dinner in honor of the visiting team at a local resort near Banjul to climax the study tour. During the ceremony, the head of GPPA, Mr. Tumbul K. Danzo, thanked Madam Meres and her team for the visit, and requested her to do all within her power to link GPPA with the Intensive Procurement School so as to enable staff to strengthen their knowledge in procurement by undertaking studies at the school.